In October 1977, Jimmy Carter was in the White House, the New York Yankees were on their way to another World Series win and the Chinese national team was in America to play three friendlies against the USA, and on their ground-breaking first tour to the capitalist West, the Chinese would also play five games in Jamaica and five in Mexico. Their opponents were an equally young US team who were fresh from winning the ‘Festival of the Americas’ and had only lost once on a five game tour of Central America. This team, consisting almost exclusively of NASL players, were seen as “the embryo that will develop into the next US World Cup entry” by the Washington Post. Flying via Tokyo and Seattle, the Chinese arrived in Washington on a Monday night and had a hectic schedule before their first game. This included visiting the White House, Capitol Hill and the US Naval Academy. Visiting the Naval Academy was particularly important as it allowed the Chinese players to train on artificial turf for the first time. Emphasising the tour’s theme of friendship, the Chinese also dined with their American hosts there. The opening game of tour was a friendly against the US national team and ended 1 – 1, Greg Villa’s goal cancelling out He Jia’s opener. The New York Times reported on a “polite game [with] few fouls” where the quick, precise Chinese play contrasted with the aggressive and fast Americans. The 8,000 crowd cheered both teams while the Stars and Stripes hanging next to the Chinese flag summed up what many felt the tour to be about. The Chinese policy was to use sports to build friendships, a view echoed by the National Committee on US-China Relations, one of the tour sponsors, who stated that “athletic encounters…are an important element in the development of mutual understanding and friendly relations.” The significance of the tour was not lost on the New York Cosmos either, as they had themselves been guests of the Chinese the month before. Their Executive Vice President stated that “the Cosmos are proud to have this opportunity to help develop warm relationships between our two peoples.” Emphasising this broader meaning, the next game of the tour, against the Cosmos at Giants Stadium, would be attended by the US Secretary of State and China’s chief delegate to the UN. The cultural aspects of the trip continued whilst in New York as the touring party attended a Broadway show, visited the Word Trade Center and were given a tour of the UN. Whilst the Cosmos had been given tours of the Forbidden City and Great Wall on their trip, the Americans were keen to show their visitors a different side of life with trips to Disney World, Coca Cola Headquarters and the Muir Redwoods Forest arranged. The Chinese were also taken bowling in Atlanta and watched the Oregon State at California american football match. 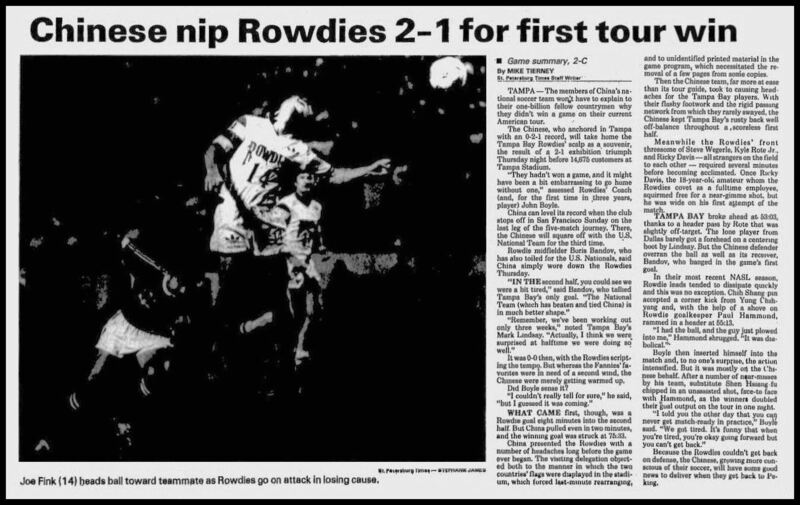 After losing 1-0 to the US in Atlanta in front of a crowd of 15,000, the Chinese then flew down to Florida to face the Tamp Bay Rowdies, including English import Rodney Marsh. After last minute rearrangements to the match programme and the flags in the stadium which the Chinese felt were disrespectful, the Chinese ran out 2-1 winners with goals from Chi Shangbin and another from Shen Xiangfu. The home keeper was unhappy about the first goal he conceded, telling the St Petersburg Times that “I had the ball and the guy just plowed into me. It was diabolical.” That was to be China’s one and only win on the first leg of their tour as they then lost 2-1 to the US at San Francisco’s Kezar Stadium in their final game in America. After being thoroughly exposed to the best America had to offer, both on and off the pitch, the Chinese touring party’s next stop was Jamaica. They beat their hosts in two friendly matches and also dispatched three domestic sides in their two weeks in the country. The final country the Chinese squad visited was Mexico where among their opponents were heavyweights Cruz Azul (2-1 loss), 1976-77 league champions UNAM (2-1 loss) and runner-up Universidad de Guadalajara (3-0 win). These games provided further valuable international experience for a country who, for political as much as footballing reasons, had only won one World Cup qualifying game in their history. Astonishingly, a photo from this leg of the trip shows the two men who would guide China to their first ever Word Cup appearance some 25 years later: Chinese defender and later assistant manager of the national team Chi Shangbin, and the Serbian manager of UNAM who would become China manager – Bora Milutinovic. Winger Shen Xiangfu would also assist Milutinovic as well as going onto manage Beijing Guoan and Shenghai Shenhua. China’s victory over Universidad de Guadalajara marked their final match of a tour that had packed in 15 games in 14 cities across three countries in under 50 days. It gave the squad experience of playing against new styles of play and in new playing conditions, allowing the players to test themselves against different opponents. The young squad from this tour were to go on to form the core of China’s national team over the coming years with seven of them in the squads for both the 1978 Asian Games and 1980 AFC Cup. Beyond this footballing importance, just by happening at all, the tour with the theme of ‘friendship first, competition second’ had achieved something that would have scarcely been imaginable ten years earlier at the height of the Cultural Revolution. At that time not only was competitive football condemned in China as being dominated by an elite core and domestic competition consequently suspended, but America was on the receiving end of strong rhetoric as public enemy number one. Times were changing by 1977 and this historic tour emphasised that. Sources: Quotes from the New York Times, Washington Post, St. Petersburg Times and this blog. Photos from this website, Tampa Bay Rowdies Blog, nasljerseys.com and Bi Chongming.